Call it middle grade fiction, children’s fiction, juvenile literature - I don't care; I love it all! 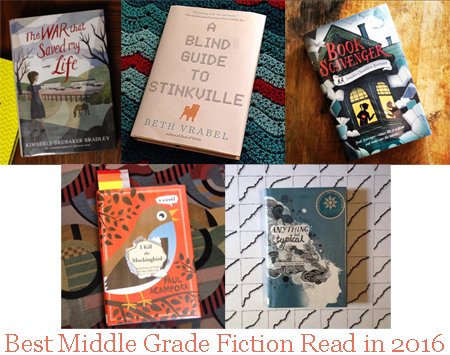 I’ve gotten really into this age level in the past couple of years, and read so much good middle grade stuff this year! A lot of my “regular” library patrons are in 5th to 7th grades, so I like recommending these titles to them, and reading what they recommend to me. The War that Saved My Life by Kimberly Brubaker Bradley (2015). Ada was born with a clubfoot, and her mother is ashamed of it. Because of that, Ada has never been out of the house, never learned anything, even though she is…or at least THINKS she is, 10 years old. Her little brother Jamie, on the other hand, is their mother’s favorite, and can play outside and attend school. As the war gets closer to London, Jamie is going to be sent to the country to stay safe. Ada sneaks out with Jamie, and they get on a train with the other children from London. People who live in the country are going to take in children until World War II is over, but what if no one wants Ada and Jamie? This was a very engrossing book, and I don’t usually enjoy historical fiction. The ending of this book is one of the most satisfying I’ve read in a long time, with a perfect last line. Highly recommended! See more raving on A BOOK A MINUTE. A Blind Guide to Stinkville by Beth Vrabel (2015). I started this book as an audiobook, and it was wonderfully read - I highly recommend it to those who have time to listen to audiobooks! My 2-year-old doesn’t give me much of a chance to listen peacefully, so after trying for a month I checked out the hardback so I could finish it - which I did in less than a day! I loved Pack of Dorks but I think I might have loved this one more… Alice has albinism so she is practically blind. When her family moves from her familiar Seattle to a new town called Sinkville (but it stinks from the paper mill, so it’s totally Stinkville), she has to try and be independent. Alice has always relied on a friend to help her get around, but now she has to make new friends and fit in, which is hard when you have albinism. Alice is a great character with a great voice, and the book is so realistic I’m still wondering how the characters are doing! Highly recommended. Book Scavenger by Jennifer Chambliss Bertman (2015). If you never read any other book I recommend, please read this one. I love this book SO much, I already want to re-read it. Codes, hidden books, visiting landmarks in an historical city - what’s not to love? Emily has been an active Book Scavenger for years, so she’s excited when her family moves to San Francisco, even though she’s tired of moving once a year. Now she’s in the hometown of the man who created Book Scavenger, and he’s about to release a new game! But when he’s mugged in a subway station, no one knows if the game creator will make it, and Emily is worried her family will move again before she can participate in the game. I Kill the Mockingbird by Paul Acampora (2014). Loved this book! Three best friends try to inspire their classmates to read, specifically To Kill a Mockingbird, by planning a daring project over the summer. I don’t want to give too much away because the plan itself, as well as how they execute it, is of course a major part of the book. But after working in a library and trying to find books that have seemingly disappeared into thin air, I really appreciate how ingenious the kids’ plan really is. Anything But Typical by Nora Raleigh Baskin (2009). Great book narrated by a boy with autism as he tries to navigate an online relationship via a writing site. This is another book I can’t really say too much about, not because I’d spoil the book, but just because it’s so brilliantly written to allow the reader to really get into Jason’s head and learn to understand him.